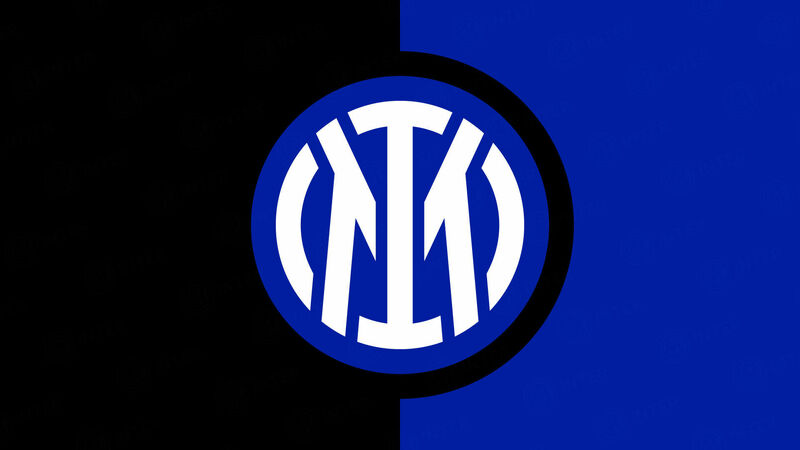 ROME - The match between Lazio and Inter ends 3-1, early game of the 15th round of the Serie A TIM 2010-2011. On 26' it was Lazio who took the lead from a corner, with Biava scoring with his 'body' after the Castellazzi-Cambiasso clearance from a Hernanes header. 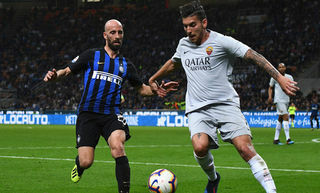 Inter struggled to get forward, unable to react they suffered a Lazio second at the beginning of the second half: Hernanes from the right crossed for Zarate, who got away from Natalino, to then beat Castellazzi with a left footed touch. After 29' of the second half the Nerazzurri manage to get back into the game through Pandev who, against his old club found the goal to end his draught: served by Sneijder, the Macedonian on a second effort with his left, after the first had hit Dias, beat Muslera. After the goal it was a new Inter, reanimated compared to before, but it was not enough and on 44' Lazio clinched the definitive 3-1 through Hernanes, who scored from a free-kick deflected by Santon. FIRST HALF - Against Lazio, Rafa Benitez fielded Castelazzi in goal, the centre-back pairing of Lucio and Cordoba, with Natalino (at his first start) and Zanetti as full-backs. After a month-long injury, noteworthy was Muntari's return, and completing the midfield were Stankovic and Cambiasso. Up front were Biabiany, Sneijder and Pandev. After 13' the first chance of the match fell to Inter, with a move started by Cambiasso, Biabiany crossed into the middle, where Muntari met the ball: the effort however ended just wide. Three minutes later it was again the Ghanaian who tried, but Muslera made the ball his with little difficulty. In the 19' there was a great move by Lazio, started by a combination between Zarate and Hernanes, the ball went into the middle for Floccari, who struck it, but Castellazzi was able to parry it. From the clearance Mauri tried to tap in the ball but Zanetti was alert and managed to save the goal. 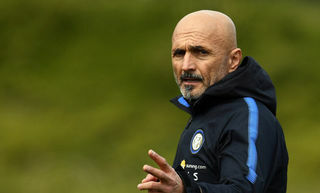 On 26' Inter got caught off guard from a corner kick: Hernanes and Floccari both headed the ball on, Castellazzi managed to get a hand to it before Cambiasso cleared it from the goal line, the ball however hit Biava on his side and bounced into the goal. It was 1-0 to Lazio. Two minutes later Lazio had the chance to double their tally but Zanetti managed to close with style. On 32' Pandev missed a golden opportunity, with his right foot, after Muslera's save from a Sneijder free-kick 30metres out. On 36' Stankovic was forced to leave the pitch due to a muscular problem following a slide. On 39' Thiago Motta, who'd only just come on, searched for the goal with a powerful left foot effort from distance, but Muslera was not caught surprised. On 42' Natalino crossed from the right, Muntari attempted an overhead kick but failed. After three minutes injury time, the first half between Lazio and Inter came to an end on the score of 1-0. SECOND HALF - The second half started with no changes, On 2' a personal move by Pandev came to nothing. On 7' came Lazio's second goal, with Zarate: Hernanes from the right switched over to Zarate who got away from Natalino to then beat Castellazzi with a beautiful left footed touch. 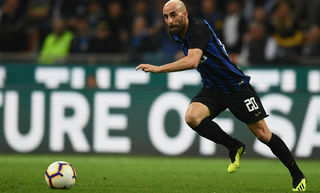 On 12' the Nerazzurri risked conceding a third, but Castellazzi managed to block Floccari's shot with his body, whilst on the second attempt Natalino blocked Mauri's effort. One minute later and there was another Lazio move, with Cordoba managing to close down Floccari. On 16' a left footed effort from the edge of the box by Hernanes ended just over the bar. On 20' came the first dangerous move by Inter in the second half, with Biabiany who served Cambiasso, but the assist was weak. On 24', first Floccari from distance and then Mauri served by Floccari, Lazio came very close to a third. On 27' Alibec on the counter-attack got to the touch line wide on the left, but his shot ended wide. One minute later Castellazzi was ready for Lichsteiner's shot. On 29' Inter managed to get back in the game, with Pandev who, against his old club, found the net and ended his draught: served by Sneijder, the Macedonian on his second attempt with his left, after the first had hit Dias, beat Muslera. On 34' Sneijder's shot was just wide, whereas immediately after Muslera was quick to save a dangerous shot from the Dutchman. 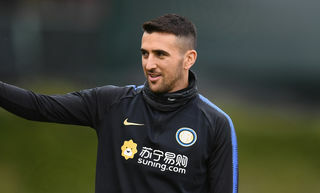 On 41' Inter came very close to the equaliser from the developments of a corner: with the ball in the Lazio box, Cordoba got his foot to it, but Muslera managed an instinct deflection. On 44' though Lazio sealed the 3-1, with Hernanes scoring from a free-kick deflected by Santon. On 49' Sneijder hit the crossbar but the game was all but over and after four minutes of injury time the game between Lazio and Inter ended 3-1. The Biancocelesti return to the top of the table on 30 points together with Milan (who has a game in hand), whereas Inter remains on 23 points. Notes: Booked: 21' Muntari, 61' Brocchi, 83' Radu. Injury times: 3' and 4'.